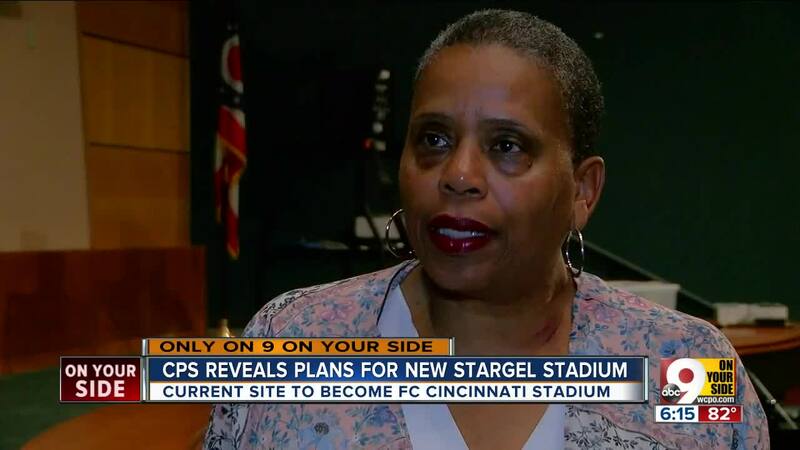 CINCINNATI – Cincinnati School Board members raised several concerns about design plans for the new Stargel Stadium after seeing them for the first time at Wednesday’s board meeting. 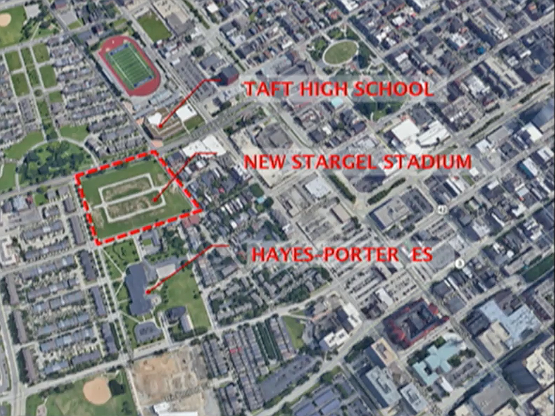 Rendering of Stargel Stadium on the south side of Ezzard Charles Drive, with Taft High School at upper right. Board members Ryan Messer and Mike Moroski called the stadium design “beautiful” and no one disagreed. But they questioned CPS Facilities Director Robin Brandon and David Hester of Elevar Design Group about a parking shortage, the lack of a connection to West End history and a perceived shortage of CPS branding. They also asked about possible intrusion on nearby residences, access to water mains, availability of gender-neutral restrooms and even the alignment of the playing field. Rendering of Stargel Stadium ticket office and entrance at corner of Ezzard Charles Drive and John Street. 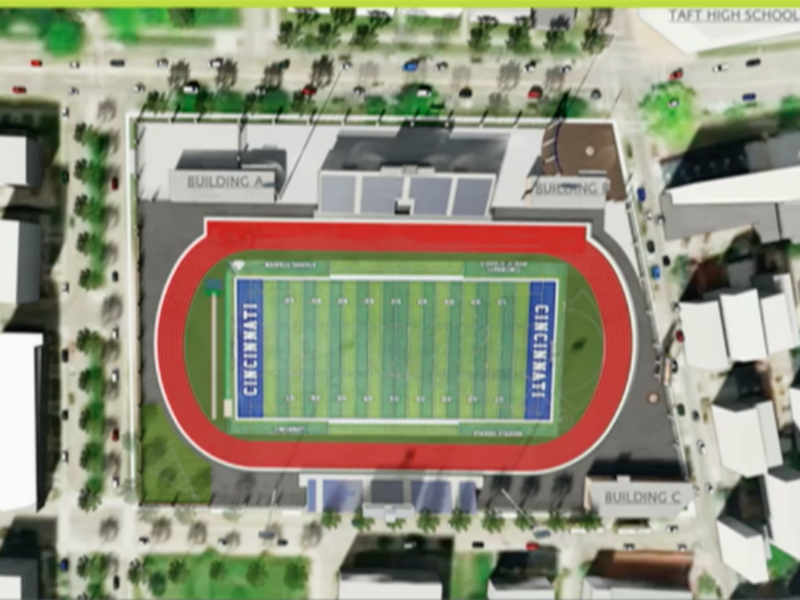 For the first time, the board saw renderings that show how the stadium would fit into the neighborhood, where the entrance and grandstands would be and how the new stadium would measure up to the old one, which has been used by Cincinnati Public Schools high school teams and is being replaced by FC Cincinnati’s new Major League Soccer stadium. 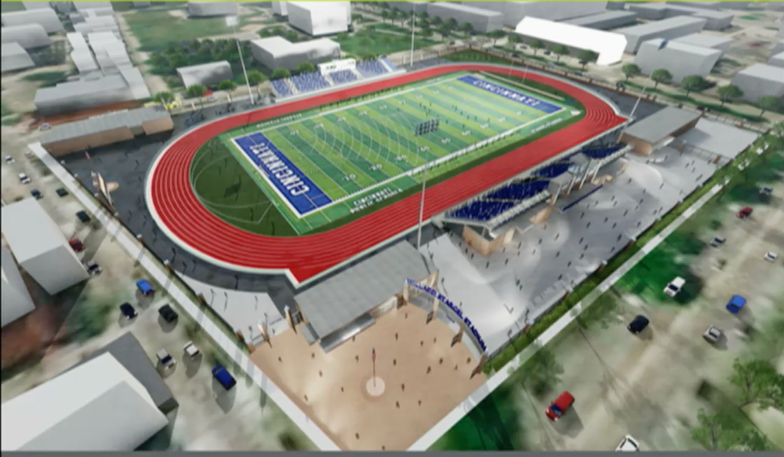 The new Stargel Stadium, to be built across Ezzard Charles Drive from Taft High School, will be larger (6.3 acres to 5.9 acres) and include such additional features as an “all-purpose community room," a weight room and LED stadium lighting, according to Hester. The press box will be twice as large as the old one, and the main concourse will have room for possible popup stands for vendors to complement the concession stands near each grandstand, Hester said. Hester and Brandon didn’t have answers to all the questions from board members, though, indicating there are still issues be resolved. Board members Eve Bolton and Melanie Bates raised a concern about the lack of parking. The stadium complex has only a few spaces for officials and staff and no room for even visiting team buses. Bolton mentioned the high parking rates at street meters and asked about the availability of the WCET studios garage two blocks away. Brandon said visitors could use 88 open spaces at Hayes Elementary, across Clark Street on the south side of the stadium. Bolton also said something needed to be added to the stadium design to commemorate the history of the West End, one of the city’s oldest neighborhoods. Moroski suggested stations like the ones in Lytle Park. Board president Carolyn Jones said she grew up in the West End and supported that idea. Bolton and Messer said it was important that CPS branding be visible throughout the stadium. The design calls for the word “CINCINNATI” to be displayed in huge letters across each end zone, as in the old stadium, but Messer suggested the words “PUBLIC SCHOOLS” be added in smaller letters. 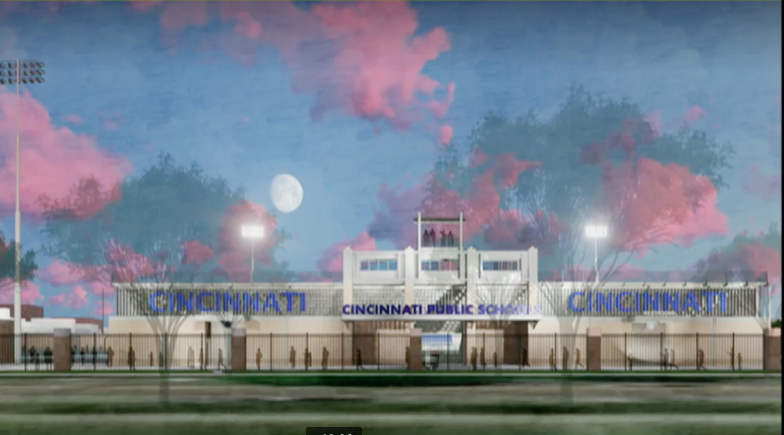 As it is, “Cincinnati Public Schools” appears on each sideline in the rendering. Messer expressed concern that the stadium would “back up” to residences along the sidestreets. Hester pointed to the rendering and assured him it would not. Brandon said three water mains service the area. Hester said three family restrooms would also serve as gender-neutral restrooms. Bolton noted the east-wide alignment of the playing field (in contrast to the typical north-south) and asked if that would pose a sight problem for players looking into the sun. Players would have to "overcome" that, Brandon said. Stargel Stadium street view of north grandstand from Ezzard_Charles Drive. Seating capacity of 3,000 will be slightly smaller than in the old stadium (3,038), with 2,000 in the north grandstand for the home team and 1,000 in the south grandstand for the visitors. There will also be an eight-lane track, same as in the old Stargel Stadium, which was built in 2004 and renovated in 2005. Building C: visiting-team locker room, concessions. Public restrooms will be located under the grandstands, and will have more spaces than the old stadium, Hester said. The public entrance, with the ticket office and the name “Willard Stargel Stadium” displayed in large letters, will be at the northeast corner at Ezzard Charles Drive and John Street. The new stadium, bounded by Clark Street on the south and Cutter Street on the west, will have fencing and landscaping around the perimeter. Keith Blake, president of the West End Community Council, told WCPO that the design team listened to the community's concerns about parking, noise and lighting. Hester said they're doing everything they can to address them. At this time, there is no plan for an in-ground marker in Stargel's honor, but a statue or monument would be considered if funding could be obtained, according to Blake. "We don't want anything in the ground. We think it's disrespectful to honor people by walking over them," Blake said. "It was acknowledged that, hey, if a funding source is found to do that, we might have something like a statue or monument to Mister Stargel." Stargel was a beloved long-time coach and teacher at Taft. He also was a star athlete at Woodward High School and the University of Cincinnati, and he was a charter member of the CPS Athletic Hall of Fame. The site was to be the location for Homearama until FC Cincinnati bought it. FC Cincinnati agreed to pay for construction of a new Stargel Stadium as part of a deal to acquire the old Stargel site north of Taft High School. Hester said they are working “pretty fast and furiously” to get the stadium built by the end of July 2019 so it will be ready for CPS football teams to use when next year’s practice starts Aug. 1. Hester said he’s hoping construction can begin in September with final designs completed before October.